Landscaping is a form of art since it involves creativity and requires a deep understanding of design principles. People who are experts in this field know the kinds of features or elements that will dramatically improve the aesthetic appeal of a property. The creative combination of various landscape elements can also make the outdoor area more functional and more comfortable to be at. With these wonderful benefits, it is just right to choose a qualified and experienced contractor to work on this kind of project. At Rainbow Acres Landscaping, we have the required experience and ability to create exquisitely designed landscapes for clients. We have been designing beautiful landscapes for residential and commercial property owners for years, making us one of the best landscaping companies that you can hire in the state. Some of the areas we service include Addison, Vergennes, Bristol, Middlebury, Burlington, Brandon, Essex Junction, South Burlington, Jericho, and Montpelier, VT. The company’s guarantee is another important factor that you have to consider. This means that your chosen landscaping company can vouch for the quality of its work and is confident about the end result of the project. And here at Rainbow Acres Landscaping, we possess all these qualities. Our clients are always guaranteed of stunning and functional landscapes at costs that won’t hurt their pockets. Most landscaping companies in the state also offer lawn care services. However, not all of them can provide the kind of service that you would expect. It is also important to ask if they can perform various lawn maintenance tasks. A reliable company can offer a comprehensive maintenance program, which include mowing, edging, trimming, pruning, fertilizing, and sodding. Other important tasks that it must offer are core aeration, dethatching, mulching, and yard cleanups. A professionally designed garden can transform an outdoor area into a beautiful and relaxing space. You can also have this kind of outdoor space if you hire the services of experienced landscapers like us. We can suggest some great garden ideas for your landscape or we can follow your concept to achieve your dream garden theme. Some of the popular garden options that you can choose from include woodland, tropical, Japanese, English, urban, wildlife, and water gardens. Creating a unique landscape design that will suit your distinct needs is not an easy task. But here at Rainbow Acres Landscaping, we have experienced landscape designers who can transform your ideas into beautiful landscape features and amenities. We can even create sustainable landscapes if you are environment conscious. 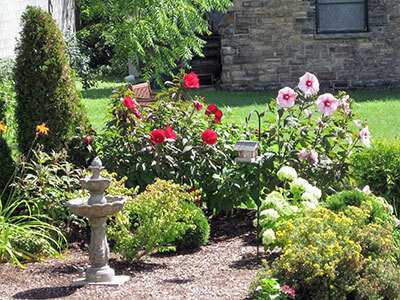 If you want a landscape that is customized according to your needs and personal lifestyle, please call Vermont’s most trusted landscaping experts - Rainbow Acres Landscaping.